Every treatment begins with the unique back diagnostic massage (except The Discovery Facial) – utterly relaxing for you and a wonderful insight for your therapist into your overall state of health – and therefore your precise needs. Deep cleansing, toning, exfoliation and a specialised facial massage (using tailored made oils and balms to target your specific skin requirement) and a specific mask is included. Whilst the mask works its magic, a relaxing hand and arm is performed. Discover what makes Decléor facials world famous with this divine ‘taster’. When you are short of time but want to bring back an irresistibly healthy complexion, this is the perfect rescue remedy. For rapid results, your expert therapist uses a combination of massage, Essential Oils and a gentle polish to smooth and revitalise tired skin leaving it fresh and radiant instead. This facial does not include the back diagnostic massage. Longing for pure indulgence? This unique aromatic facial is devoted solely to massage and is the ultimate for deep relaxation, relieving fatigue, stress and tension, whilst filling your skin with a new breath of life. Essences and balms, chosen to meet your skin’s needs, are applied using a combination of gentle pressure points, sweeping drainage movements and soothing aromatherapy massage to the face, neck, decollete and shoulders, leaving even the dullest of skins with a natural radiance. 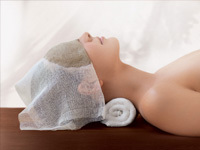 The application of hot towels and a soothing hand and arm massage complete this sublime experience. Being a relaxation treatment, this facial does not include deep cleansing, exfoliation or mask…get ready to slip into complete and utter relaxation. One hour of absolute facial bliss (including a signature back massage). An indispensable treatment to restore perfect balance and essential well-being to the skin leaving you looking visibly radiant. This Internationally renowned, multi-award winning facial is power-packed with vitamins and anti-oxidants. Stress simply melts away thanks to five deeply relaxing massage techniques and the ideal rebalancing aromatic elixir suitable for your complexion. For all skin types from problematic to mature or anyone that needs a boost for their skin prior to a special occasion. Incorporates “The Aromaplasty” Mask, an individually sealed multi-vitamin mask made from 100% natural flax seeds, wheat germ and sunflower seeds. This is applied warm which softly cocoons the skin opening up the pores to push the active ingredients into the skin. As it cools down it causes the pores to close, sealing in the active ingredients to intensely treat the skin. Skin is left deeply cleansed, perfectly replenished and glowing with vitality. For further Facials please return to the Facial Treatments menu and click through the list.